Easter Bunny Time: Easter is very late this year, Sunday 21 April, virtually guaranteeing a sunny and warm day in the Brickyard flower-filled garden for egg hunts and our live jazz Easter Brunch. See the menu and pricing. Be sure to book early as we have one seating with limited spaces. Right now the apricots are blossoming all over the warm south-facing slopes around Mutianyu, softening the hills gently, harkening to the coming riot of Spring colors. Great time of the years for hiking and biking. After a healthy day you could unwind with the Brickyard Skewers & Beer Party this Saturday 30 March. 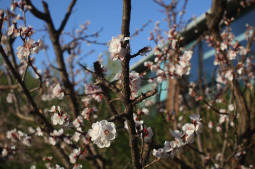 Pictured is one of our apricot trees in the Brickyard spa garden from last year that is already budding. 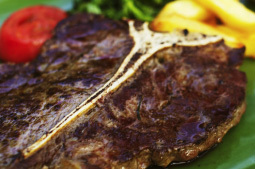 Imagine sizzling steaks (as well as chicken, trout, burgers, and veggies) grilled to your order at our Saturday evening live jazz grills in April on the 6th and 20th. 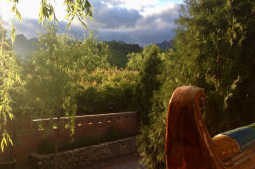 Head back to town after dinner or stay the night to wake up to morning sun reflecting off the Great Wall. New garden walls, new outdoor furniture, new hallways to the guest rooms, repairs, Spring painting, Spring planting… we are keeping the Brickyard up and keeping it fresh for new and returning guests. Image of our Spa Garden taken earlier this week. 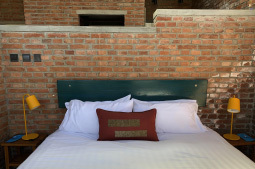 Our partner Liang Tang designed and fabricated one-of-a-kind throw pillows and runners for every Brickyard room. Each piece incorporates scraps of antique embroidery by Chinese ethnic minorities from her extensive collection. Her studio is located in The Schoolhouse where she designs and showcases her textile works. Learn more. 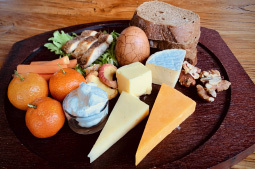 Our new Cold Platter hits the spot: Our smoked trout, hard boiled tea egg, various cheeses, butter, and spreads, fresh fruit, house dried local fruit, local walnuts, our date and rye breads. Perfect with a glass of wine, great as meal in itself. See the entire new Spring menu. 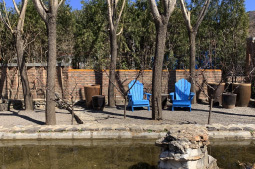 China Daily recently reported on businesses giving rural communities a welcome shot in the arm, featuring Brickyard Retreat as a model example of profitable hospitality. See their take. Mother’s Day Head’s Up: Wouldn’t a casual Mother’s Day in the mountain fresh air with a fresh country grill, live jazz, and a place for the kids to scamper about while Mom and Dad relax in the sun be something special? The Brickyard’s “A Rose for Every Mother” Champagne Brunch will be on Sunday 12 May. Learn more and be sure to book early. This is a dish offered on our new Spring menu. 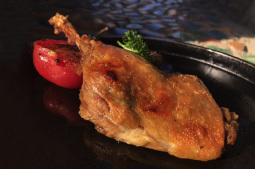 We slow cook duck leg for more than six hours in its own fat and then grill the confit duck right before serving hot and golden crispy. It’s easier to do than it sounds and executive chef Randhir Singh is happy to share his recipe so you can make it at home. Have a look. 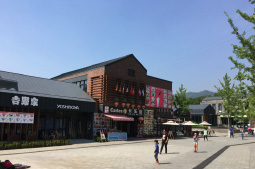 The only part of Mutianyu Great Wall that doesn’t ring true is the Visitor Center, a suburban outdoor mall with fast food outlets, which fortunately Brickyard guests can bypass completely. It’s hard for us to understand how so many Chinese parks charge high fees, ignore the local communities, and actually turn their backs on heritage. We found this article thought-provoking. Our business model predicates that social order and company good citizenship are in themselves aspects of sustainability. 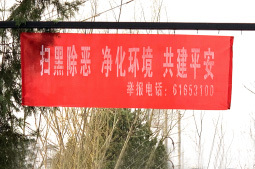 As instructed by the local Public Security Bureau we have adorned our driveway with the 2 meter red banner shown above: Eliminating evil, purifying the environment, and building peace.